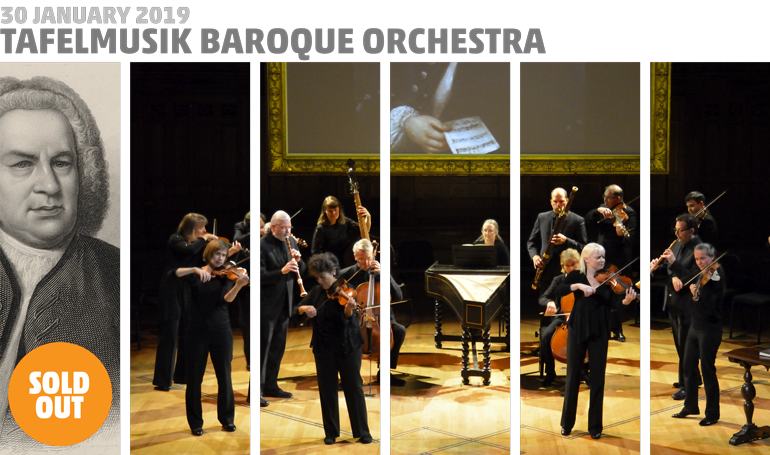 Tafelmusik Baroque Orchestra is “one of the world’s top orchestras” (Gramophone). Hosted by the Manitoba Chamber Orchestra, they present JS Bach: The Circle of Creation — a celebration of the genius of Bach and the latest multi-media creation by Alison Mackay, the creator of phenomenally successful Tafelmusik productions seen around the world. JS Bach: The Circle of Creation combines text, music, and stunning projected video and images to explore the world of the artisans — papermakers, violin carvers, string spinners, and performers — who helped JS Bach realize his musical genius. This all-Bach programme is performed by Tafelmusik musicians entirely from memory. Tafelmusik, Canada’s award-winning period instrument orchestra, was founded in 1979 and has long been renowned in North America and internationally for its distinct, exhilarating and soulful performances. It has excelled equally in music ranging from the baroque and classical eras and beyond, including adventurous cross-cultural reinventions of baroque classics. The concert begins at 7.30pm on January 30th in Westminster United Church, 745 Westminster at Maryland. Tickets, at $35 for adults, $33 for seniors and $15 for students and those under-30 (incl. GST), are available at McNally Robinson, Organic Planet (877 Westminster Ave), and on MCO’s Ticketline at 204-783-7377. Click above to add ticket to cart; adjust quantity in cart; click ‘Continue Shopping’ for other tickets. Movements from Cantatas 249a, 202, 208, 42, & 11, and Goldberg Variations #18 & 22 transcribed & arranged by Alison Mackay. Sonata bwv 1005 arranged by Christopher Verrette. Renowned for its dynamic, engaging, and soulful performances, Tafelmusik is one of the world’s leading period-instrument ensembles, performing on instruments and in styles appropriate for the era of the music. Last season we welcomed new Music Director Elisa Citterio: only the second Music Director in Tafelmusik’s history, she took over from Music Director Emerita Jeanne Lamon. We are Canada’s most toured orchestra, having performed in over 350 cities in 32 countries, and are proud to call Toronto our home. There we perform some 80 concerts each year for a loyal and enthusiastic audience in diverse venues across the city. The orchestra is joined in performances by the critically acclaimed Tafelmusik Chamber Choir and its director Ivars Taurins. Tafelmusik seeks to transport audiences to the Baroque and Classical periods through adventurous cross-cultural collaborations, on stage with Toronto’s Opera Atelier, and underground at our Haus Musik series. Our musicians share their knowledge and experience through artist-training initiatives such as the Tafelmusik Baroque Summer and Winter Institutes. Tafelmusik has released over 90 recordings, and are honoured to have received nine JUNOs and numerous international recording prizes. We have toured J.S. Bach: The Circle of Creation to Ontario, Québec, the Maritimes, the US, Puerto Rico, China, South Korea, and Australia, and are thrilled to be bringing it to British Columbia, Alberta, and Manitoba this season. The brilliant violinist Elisa Citterio joined Tafelmusik as Music Director last season. She moved to Toronto from her native Italy, where she divided her artistic life between orchestral work and an intense schedule as a chamber musician. She has recorded and toured, often as leader, with such ensembles as Dolce & Tempesta, Europa Galante, Accademia Bizantina, Accordone, Zefiro, la Venexiana, La Risonanza, Ensemble 415, Concerto Italiano, Orquestra del Monsalvat, Il Giardino Armonico, and Orchestra Academia 1750. From 2004 she was a member of the Orchestra del Teatro della Scala di Milano. Elisa graduated with highest honours in violin and viola from the L. Marenzio Conservatory in her hometown of Brescia. Post-graduate work included baroque violin studies with Enrico Onofri, Luigi Mangiocavallo, and Chiara Banchini. Her discography includes more than 35 recordings of Vivaldi, Bach, Handel, Corelli, Monteverdi, and Haydn. Alison Mackay, who has played the violone and double bass with Tafelmusik since 1979, is active in the creation of cross-cultural and multi-disciplinary programmes for the orchestra. A number of her projects, which include The Four Seasons, a Cycle of the Sun; The Galileo Project; House of Dreams; and Tales of Two Cities: The Leipzig Damascus Coffee House, have been made into feature documentary films and have toured extensively around the world. Her musical tale of adventure, The Quest for Arundo Donax, was awarded the 2006 JUNO Award for Children’s Recording of the Year, and she is the recipient of the 2013 Betty Webster Award for her contribution to orchestral life in Canada. Kevin is thrilled to have been asked to be a part of Tafelmusik’s Western Canada tour. A professional actor since 1986, Kevin has performed in many of the major theatres across Canada. He was a member of the Shaw Festival’s Acting Company for seven seasons, and of the Stratford Festival for five. He has performed in dozens of Soulpepper Theatre Company productions since 2005. His most recent credits include The Wars and Chariots of Fire at The Grand Theatre, London, and Confederacy Parts 1 & 2 with Video Cabaret, which garnered a 2018 Best Ensemble Performance Dora Nomination in Toronto. He will soon be appearing in Kat Sandler’s new play, directed by Daryl Clorran (artistic director of the Citadel Theatre), at the Citadel Theatre in Edmonton. Kevin is a graduate of The National Theatre School of Canada. Programme notes by Alison Mackay. J.S. Bach: The Circle of Creation is a celebration of the genius of Johann Sebastian Bach, with an emphasis on the instrumental music that he created for his family, his students and his colleagues. Using words and images, the performance also honours the artisans and tradespeople whose labours and expertise made the performance of Bach’s music possible, both in his own time and in the 21st century. The concert begins and ends with poetry about the honorary patrons of Bach’s city of Leipzig—the Roman god of music, Apollo, and his brother Mercury, who made a glorious musical instrument from the shell of a tortoise and seven strings of sheep gut. Two millennia later, the instrument makers of the eighteenth century still used materials from the natural world—bird feathers for the quills that pluck harpsichord strings, maple and spruce for the bodies of stringed instruments, and boxwood for oboes. Sheep intestines were still used to create strings for Bach’s instruments, and brass strings were made by hand for his harpsichords. Centuries-old methods are still used today for the making of historical strings for period instruments. Because the guild members of early modern Europe were obliged to guard their trade secrets, modern makers have had to be detectives, using forensic evidence from scraps of old strings and sources such as Diderot’s eighteenth-century encyclopedias to determine the materials and techniques that would have been used for Bach’s instruments. The images seen in the concert portray artisans from Bach’s time as well as modern instrument builders who use historical techniques to create instruments for the Tafelmusik Orchestra. Film footage and still photographs created specially for this performance feature Toronto builder and restorer Quentin Playfair, who made a cello inspired by an instrument from the Stradivarius workshop in 1726; English harpsichord and string-maker Malcolm Rose; American oboe-maker Harry vas Dias; German bassoon-maker Peter Wolf; Toronto bow-maker Stephen Marvin; and the artisans of the Aquila String factory in Italy. Much of the music on the programme is typical of the works that would have been performed at Café Zimmerman in the centre of Leipzig. In 1695, the merchants’ guild of Leipzig had petitioned the town council for “street lanterns that would, as in Vienna and Berlin, burn all night to prevent incessant nocturnal crime.” On Christmas Eve of 1701, 700 oil-fuelled streetlights were installed in the city, making it safe for the first time for all citizens to walk freely at night, transforming coffeehouses into venues for recreation and music. Bach directed an ensemble which performed on Friday nights at the cafe for which the owner, Gottfried Zimmerman, acquired a set of musical instruments. The orchestral suites bwv 1066 and 1068, the third Brandenburg concerto, the Trio Sonata BWV 1039, the Goldberg Variations, and the shorter solos for harpsichord, violin, or cello are typical of music that Bach would have performed with members of his family, university students, and amateur players of the ensemble known as the Collegium Musicum. Professional players from the Leipzig town band also participated in these performances. These municipal musicians had responsibilities for outdoor performances from balconies at City Hall or one of the church steeples in town. Gloria laus et honour and Wachet auf, ruft uns die Stimme are well-known hymn tunes that would have been played instrumentally by these performers. They were given salaries, clothing, music, instruments, and housing for themselves and their families in the Stadtpfeiffer Gässchen (City Pipers’ Lane), which was also the traditional street for the city’s midwives. In 1746, the Dresden official court painter Elias Gottlob Haussmann painted a portrait of the 61-year-old Bach holding, as was customary, an emblem of his art. Rather than being pictured with a keyboard, the famous virtuoso chose instead to hold a small piece of paper with three short lines of music—the first eight notes of the bass line of the Goldberg Variations with a six-part canon written in code. It was a powerful symbol of Bach’s roles as composer, performer, and teacher. Like the instrument makers who made his violins and harpsichords, Bach regarded himself as a craftsman who had inherited much from the guild musicians who were his forebears. In June of 2014, the members of Tafelmusik were invited to live in the city of Leipzig for two weeks as orchestra-in-residence at the annual festival that celebrates his legacy. Immersed in the atmosphere of Bach’s hometown, we were able to explore the craft of Bach’s own artisans, guided by our generous partners and advisors at the Bach Museum, who have provided many of the images for this project. The concert ends with a reflection on human hands and the thousands of hours it takes to master the use of a violin bow or a chisel. In the long hours of labour, musicians, and artisans are sustained by the beauty of materials, the artistry of their tools, the guidance of inspiring mentors, and the exhilaration of exploring the art of a great genius. We share with our audiences around the world an abiding love for the music of J.S. Bach, and it is a privilege to be able to perform it in celebration of his art and in recognition of the artisans, scholar, tradespeople, and music lovers who have made our performing lives possible. Jean-Marc St. Pierre of MAJ productions in Montréal for permission to use his footage of the Aquila factory. Timothy Barrett, Director of the Iowa Center of the Book, and filmmaker Avi Michael, creator of the film Chancery Papermaking, for the footage of paper being made as in the time of Bach. Dr. Daniel Geiger of the Museum of Natural History, Santa Barbara, California for his magnified images of materials from Bach’s world. The Bach Museum, Leipzig, for permission to use images from the museum. Production designer Glenn Davidson for creating the photo sequences of hands and Saxon sheep.